Germany is infamously known to be Europe’s forerunner. That may well be true for trying to manage the Euro-crisis, technological quality products, and a well-doing economy in times of general trouble. 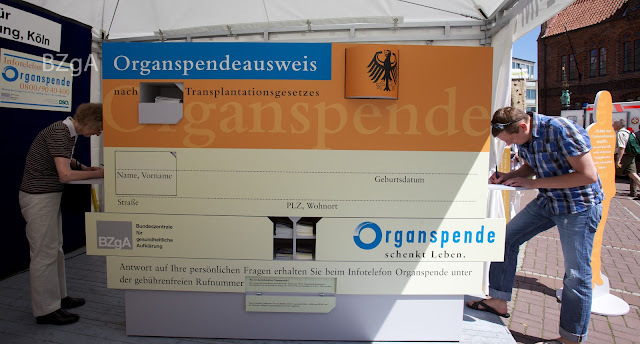 But when it comes to the sensitive topic of organ donations, the picture is actually reversed: Germany is struggling with a lack of donations and therefore the World Health Organisation’s criteria of self-sufficiency since years. A current law reform tries to challenge this. But there is more controversy behind the debate than just the question how to approach the people with this sensitive topic. Around 12.000 seriously ill Germans are on waiting lists for life-saving organ donations, at the moment. Every day three of them die, because of a lack of suitable organs. “We need to approach the people, by asking and double-checking”, as former foreign minister and living kidney-donor Dr. Frank-Walter Steinmeier emphasises, “there is no inviolable right of the people to be undisturbed by this topic.” But is that really the case and what is behind the allegedly insufficient German willingness to donate? On first glance, the situation seems to be a dilemma: As the number of patients waiting for a liver, a kidney, pancreas, duodenum, lungs or a heart is constantly rising and reached a peak of 2.778 council enquiries in 2011, the number of donors is stagnating since years. In 2011 it reached a level of 1200 donors in total which displays a decline of 100 donors in comparison to the previous year. On second glance instead, the situation resembles more a paradox: Whilst 74% of German men and women are potentially willing to donate an organ, only 25% of these people possess an organ donor card. There seems to be a need to bridge a divide between the German aspiration to be Europe’s forerunning country and its empirical truth, when it comes to this controversial topic. For Birgit Blome, spokeswoman of the German Organ Transplantation Foundation (DSO), which is responsible for the coordination of organ donations in Germany, it is clear, that “it is not the missing will to donate. The problem is the lack of information and the realisation in the hospitals.” To understand what Mrs. Blome means, one has to have some knowledge about the previous and the present German legislation. Before the reform, the so called ‘extended consent solution’ was prevailing law. Meaning that potential donors either had to fill in an organ donor card voluntarily during lifetime, or relatives had to decide about a potential organ donation. In case of an accident, for example, they had to base their decision on the presumed will of their kinsman. A difficult situation for the relatives, as one can imagine. Another major point of the reform is the implementation of transplant coordinators, mandatory for every hospital with an intensive care unit. The devil was not exactly in detail but rather structural, as Mrs. Blome reports: “due to staff shortage in the intensive care units potential donors were often not reported to us. The possibility of an organ donation was treated as an additional burden and consequently neglected. Therefore the DSO welcomes the installation of transplant coordinators as the most important improvement of the reform.” With this change the Federal German government follows an allegedly success story: Widening the view to an international perspective, appointed transplant coordinators are effectively pre-existent in other European countries, such as Spain where donation rates are the highest in the world with 32 donors per one million inhabitants. However, there is doubt about a successful implementation in the German case: “staff and expenses are kept at a minimum in modern hospitals there will be a high pressure from the business executives to keep this enormous extra effort at the lowest level possible”, Dr. Bavastro remarks. On a site note it is remarkable that due to its federal system, transplant coordinators were already appointed in eight out of 16 states. A real turning point might look different. Another Bone of Contention: Brain Death equals Death? An additional point of criticism is the lack of additional instrument-based diagnostic investigation. The phenomena of brain deaths giving birth and reactions physical of brain deaths during organ removal shed a critical light on the criteria. Dr. Bavastro states: “The equalisation of brain death and death is a severe lie. Why else should organs be extracted under anaesthesia?” Pastor Lauterjung adds: “we accurately have to account for the process of dying. In case of uncertainty we have to state that the process is over when all organs stopped working irreversibly – even if that contradicts a potential donation.” There are counter-arguments to these accusations, neurologist Dr. Stephanie Förderreuther, for example defines brain death as “clinically definite and reliable proof of death”, and ongoing she concludes that “without brain function, the unity of a person both physically and spiritually is no longer existent.” However, these contradictory opinions show how sensitive the topic is, in medical and in ethical views. When there is a vital dispute among experts, how can ordinary people be self-confident with their individual decision then? Not to mention taking over the decision for a relative. Which effect will come into place is not to be predicted, yet. An increase of potential donors may well happen, as public awareness will rise. However, as long as there is no consensus in EU-legislation and no consensus in medical criteria for transplantations, it remains doubtable, whether public trust will rise significantly. For the German case that may entail that the World Health Organisation’s goal of self-sufficiency will not be reached in the near future.